On the northern side of the Preseli Mountains is an area of wet and dry heathland - Brynberian Moor. Wellies will be required in the boggy areas.
" Drosera Intermedia ", A low growing perennial plant. 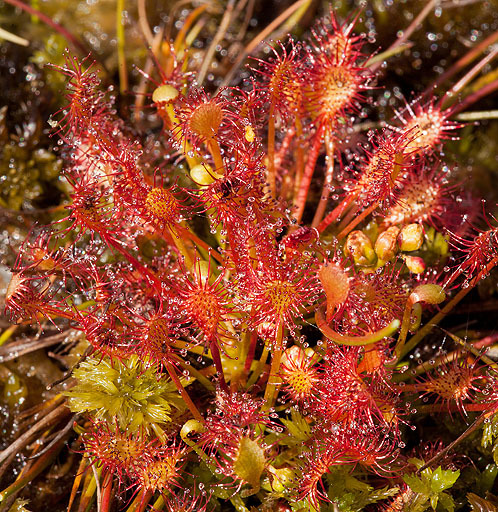 Sundews are carnivorous plants which usually live in wet habitats where the acidic conditions limit the amount of nutrients they can extract from the soil. These plants therefore supplement their diet by catching and digesting small creatures such as insects. The Sundews relies on first trapping its prey with its sticky, glandular hairs, before it slowly rolls up the edges of the leaf . The hairs are stalked glands and produce digestive juices that decompose the trapped prey.